If you are not sure what Kafka is, start here “What is Kafka?”. This Kafka tutorial picks up right where the first Kafka tutorial from the command line left off. The first tutorial has instructions on how to run ZooKeeper and use Kafka utils. In this tutorial, we are going to run many Kafka Nodes on our development laptop so that you will need at least 16 GB of RAM for local dev machine. You can run just two servers if you have less memory than 16 GB. We are going to create a replicated topic. We then demonstrate consumer failover and broker failover. We also demonstrate load balancing Kafka consumers. We show how, with many groups, Kafka acts like a Publish/Subscribe. But, when we put all of our consumers in the same group, Kafka will load share the messages to the consumers in the same group (more like a queue than a topic in a traditional MOM sense). If not already running, then start up ZooKeeper (./run-zookeeper.sh from the first tutorial). Also, shut down Kafka from the first tutorial. Next, you need to copy server properties for three brokers (detailed instructions to follow). Then we will modify these Kafka server properties to add unique Kafka ports, Kafka log locations, and unique Broker ids. Then we will create three scripts to start these servers up using these properties, and then start the servers. Lastly, we create replicated topic and use it to demonstrate Kafka consumer failover, and Kafka broker failover. In this section, we will copy the existing Kafka server.properties to server-0.properties, server-1.properties, and server-2.properties. Then we change server-0.properties to set log.dirs to “./logs/kafka-0. Then we modify server-1.properties to set port to 9093, broker id to 1, and log.dirs to “./logs/kafka-1”. Lastly modify server-2.properties to use port 9094, broker id 2, and log.dirs “./logs/kafka-2”. With your favorite text editor change server-0.properties so that log.dirs is set to ./logs/kafka-0. Leave the rest of the file the same. Make sure log.dirs is only defined once. With your favorite text editor change log.dirs, broker.id and and log.dirs of server-1.properties as follows. With your favorite text editor change log.dirs, broker.id and and log.dirs of server-2.properties as follows. The startup scripts will just run kafka-server-start.sh with the corresponding properties file. Notice we are passing the Kafka server properties files that we created in the last step. Now run all three in separate terminals/shells. Give the servers a minute to startup and connect to ZooKeeper. Now we will create a replicated topic that the console producers and console consumers can use. Notice that the replication factor gets set to 3, and the topic name is my-failsafe-topic, and like before it has 13 partitions. Then we just have to run the script to create the topic. Next, create a script that starts the consumer and then start the consumer with the script. Notice that a list of Kafka servers is passed to --bootstrap-server parameter. Only, two of the three servers get passed that we ran earlier. Even though only one broker is needed, the consumer client will learn about the other broker from just one server. Usually, you list multiple brokers in case there is an outage so that the client can connect. Now we just run this script to start the consumer. Next, we create a script that starts the producer. Then launch the producer with the script you create. Notice we start Kafka producer and pass it a list of Kafka Brokers to use via the parameter --broker-list. Now use the start producer script to launch the producer as follows. Now send some message from the producer to Kafka and see those messages consumed by the consumer. Now Start two more consumers in their own terminal window and send more messages from the producer. Notice that the messages are sent to all of the consumers because each consumer is in a different consumer group. Stop the producers and the consumers from before, but leave Kafka and ZooKeeper running. Now let’s modify the start-consumer-console-replicated.sh script to add a Kafka consumer group. We want to put all of the consumers in same consumer group. This way the consumers will share the messages as each consumer in the consumer group will get its share of partitions. Notice that the script is the same as before except we added --consumer-property group.id=mygroup which will put every consumer that runs with this script into the mygroup consumer group. Now we just run the producer and three consumers. Now send seven messages from the Kafka producer console. Notice that the messages are spread evenly among the consumers. Notice the first consumer gets messages m3 and m5. Notice the second consumer gets messages m2 and m6. Notice the third consumer gets messages m1, m4 and m7. Notice that each consumer in the group got a share of the messages. Next, let’s demonstrate consumer failover by killing one of the consumers and sending seven more messages. Kafka should divide up the work to the consumers that are running. First, kill the third consumer (CTRL-C in the consumer terminal does the trick). Now send seven more messages with the Kafka console-producer. Notice that the messages are spread evenly among the remaining consumers. The first consumer got m8, m9, m11 and m14. The second consumer got m10, m12, and m13. We killed one consumer, sent seven more messages, and saw Kafka spread the load to remaining consumers. Kafka consumer failover works! You can use kafka-topics.sh to see how the Kafka topic is laid out among the Kafka brokers. The ---describe will show partitions, ISRs, and broker partition leadership. Let’s run kafka-topics.sh --describe and see the topology of our my-failsafe-topic. We are going to lists which broker owns (leader of) which partition, and list replicas and ISRs of each partition. ISRs are replicas that are up to date. Remember there are 13 topics. Notice how each broker gets a share of the partitions as leaders and followers. Also, see how Kafka replicates the partitions on each broker. Let’s kill the first broker, and then test the failover. You can stop the first broker by hitting CTRL-C in the broker terminal or by running the above command. Now that the first Kafka broker has stopped, let’s use Kafka topics describe to see that new leaders were elected! Notice how Kafka spreads the leadership over the 2nd and 3rd Kafka brokers. Let’s prove that failover worked by sending two more messages from the producer console. Then notice if the consumers still get the messages. Send the message m15 and m16. Notice that the messages are spread evenly among the remaining live consumers. The first Kafka broker gets m16. 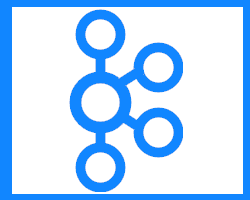 The second Kafka broker gets m15. Why did the three consumers not load share the messages at first? They did not load share at first because they were each in a different consumer group. Consumer groups each subscribe to a topic and maintain their own offsets per partition in that topic. How did we demonstrate failover for consumers? We shut a consumer down. Then we sent more messages. We observed Kafka spreading messages to the remaining cluster. How did we show failover for producers? We didn’t. We showed failover for Kafka brokers by shutting one down, then using the producer console to send two more messages. Then we saw that the producer used the remaining Kafka brokers. Those Kafka brokers then delivered the messages to the live consumers. What tool and option did we use to show ownership of partitions and the ISRs? We used kafka-topics.sh using the --describe option. To learn about Kafka see Kafka architecture, Kafka topic architecture and Kafka producer architecture.